Coronado scorned this region as unpopulated when he labored through southeastern Arizona in 1540, but he could have found 12,000-year-old spear points in the remains of giant bison near Cave Creek Cienega, grinding hollows in boulders, and shamanic figures in high caves of the Chiricahuas towering above valleys and grasslands. Searing drought forced people to abandon their villages by 1400, but Apaches wandered down from Canada about the time Spaniards passed by. Thousands of forty-niners traveled in sight of the mountains on their race to California. The Chiricahua Apaches were exiled to Florida in 1886; even earlier, their lands were opened to settlement. Portal began in 1902 as a rest stop between the railroad and the boom town of Paradise. Since 1956, the Southwestern Research Station of the American Museum of Natural History has attracted countless researchers. The present community is a vibrant mix of biologists, birders, astronomers, writers, artists, and ranchers, united by love for this unique canyon. Professional reference photographer Deborah Galloway, an enthusiastic genealogist and birder, teamed with historical novelist Jeanne Williams to create this book, drawing mostly from images loaned by neighbors who generously shared their families' stories. Other images were chosen from the National Archives and the Coronado National Forest. 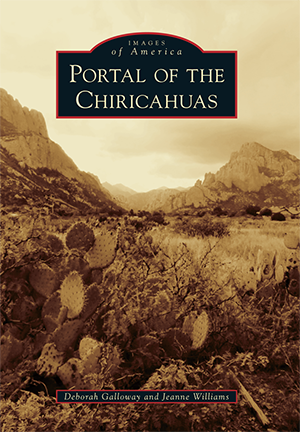 The authors founded the Chiricahua-Peloncillo Historical Society, with Galloway as its first president.